Hi, everyone! I hope you’ve had a great week so far. Today I’m sharing this floral maxi that I am obsessed with. 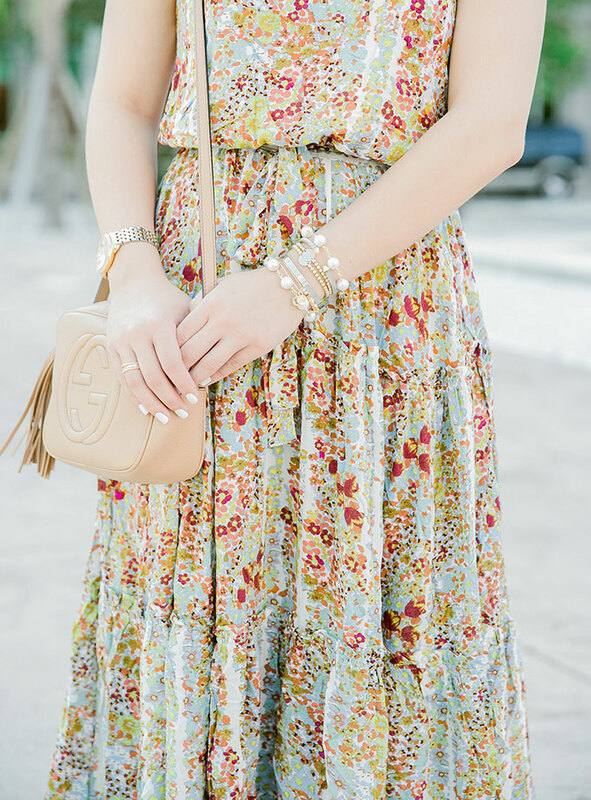 This floral maxi dress is perfect on so many levels. It’s comfortable, flattering, pretty and perfect for spring and summer! While it’s a little more expensive, you can feel it in the quality and just how perfectly it falls on you. Also, these shoes are old and not available but I’ve linked a few similar options below that I am dying to get my hands (or feet) on! PS. Make sure to size down in this dress! It runs big. I am loving this print and this maxi dress. What a beautiful dress for any getaway! This dress is so gorgeous! The colors are seriously perfect for spring. That floral maxi is too cute! I love the colors! What a pretty dress! I love maxis this time of year. Gorgeous dress! Great for summer/spring weather. Love the maxi dress the floral print is perfect! This dress is SO pretty on you!!! These pictures are gorgeous…per usual! So pretty and love the bag with it! Such a gorgeous maxi, love the print! You are adorable! I love this dress too! This is such a pretty floral. I love the colours in it. You seriously have the best bags!! We at VacayStyle love your taste in Maxidresses. That’s what we’re all about. We’d love to collab with you in some way. We’ve reached out via email. Keep up the great work on this site. Such a stunning maxi! I totally agree with you – it’s absolutely the perfect spring/summer dress, and so very flattering! Lovely maxi dress – love it!!! If you still haven’t, come check out and join this huge GIVEAWAY I am hosting for JEWELRY TELEVISION (JTV) where a dazzling pair of 18K gold ASHLEY HOFFMAN earrings is at stake – Have a lovely weekend too!! You look so gorgeous!! I love how effortless and flirty the dress is and I love that it’s not quite full length, it makes it feel so much more lightweight! I love this dress. I love Free People! These are great photos-the dress is such a gorgeous piece!